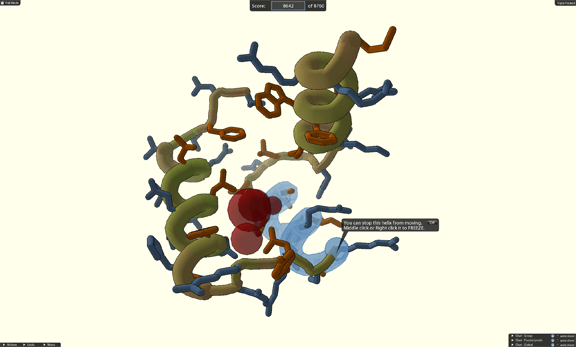 Foldit is a computer game that enables players to support advances in health and the treatment of disease by determining the structure of proteins – the complex molecules that enable life functions such as digesting food, carrying oxygen in the blood, and providing energy to muscles. 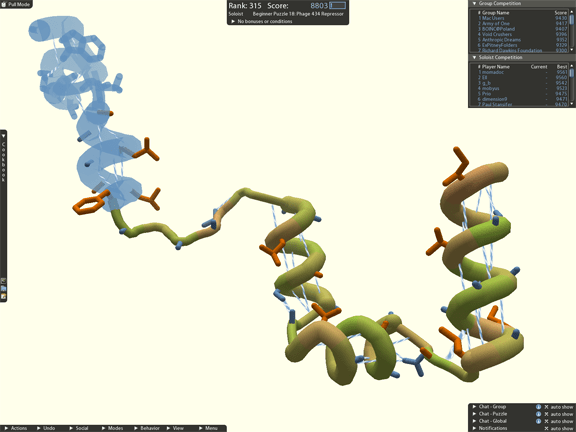 Foldit players use controls in a computer model to manipulate the position of amino acids (the building blocks of a protein) into their most stable configuration. The physical structure of a protein (the way the the chain of amino acids folds) is key to how the protein functions. A protein’s physical structure determines the molecules with which a protein can bind and interact. What is the impact of determining a protein’s structure and designing a new protein to interact with it? Two major health challenges demonstrate how a protein-based intervention can disrupt a disease process. One example is HIV. The replication of HIV in the body is accomplished through the action of proteins. HIV medications disrupt the action of HIV proteins, thereby preventing replication of the virus. When viral load decreases, the infected individual is healthier and the chance of spreading the virus to another person is diminished. Another example is Alzheimer’s disease. Short protein segments are the byproduct of a normal protein function in the brain. It is thought that clumps of this short protein are a contributory factor in the disease. A protein intervention has the potential to disrupt the protein clumping seen in people with the disease. 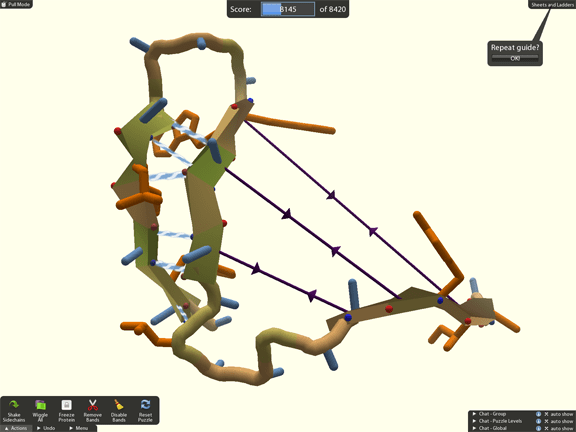 Foldit’s visual representation of amino acid chains enables its players to solve fundamental protein structural mysteries and ultimately use the solutions to intervene in pathological processes. A Foldit introductory level introduces freezing. A large red void in the center of the protein shows empty space to be filled. Foldit players have control over which parts of the protein they want to move. In this picture, a player has frozen some curly helices, which keeps them in place while they adjust the rest of the protein. Foldit players use a variety of tools to interactively reshape proteins. In this picture, a player uses rubber bands to pull together two sheets, long flat regions of the protein. For additional information visit the Foldit website .